I dwell too much on the art of Europe. In 1918, there were many exciting artists working in North America, and many significant landscape paintings were created there. So in this concluding survey of paintings of that year, I will look at a few from the New World first. 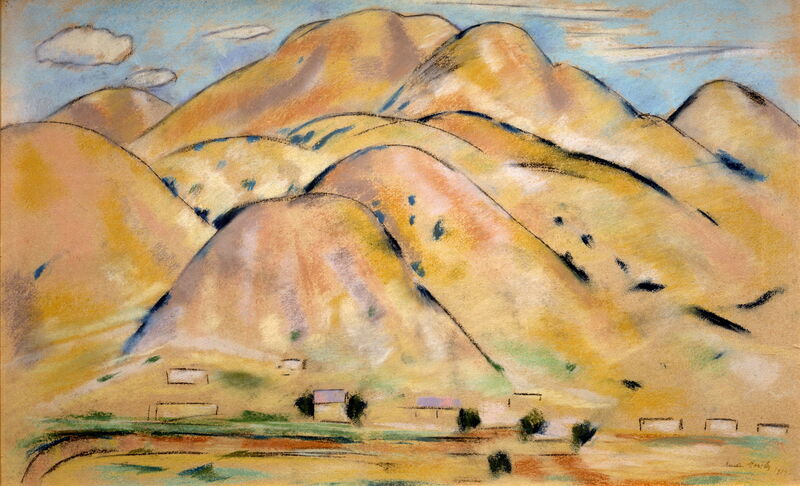 Marsden Hartley (1877–1943), Arroyo Hondo (1918), pastel on paper, 45.7 x 71.1 cm, Private collection, on loan to Boca Raton Museum of Art, Boca Raton, FL. Wikimedia Commons. 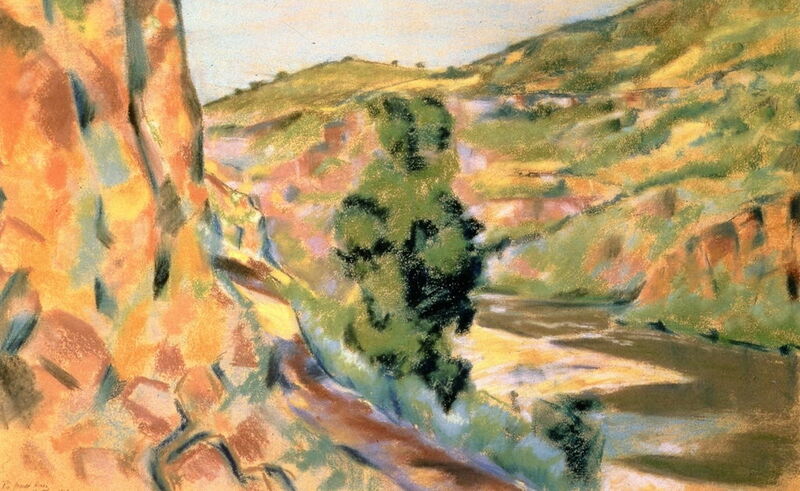 Marsden Hartley (1877–1943), Rio Grande River (1918), pastel on paper, dimensions not known, Private collection. The Athenaeum. Rio Grande River is another pastel from Hartley’s New Mexico campaign. 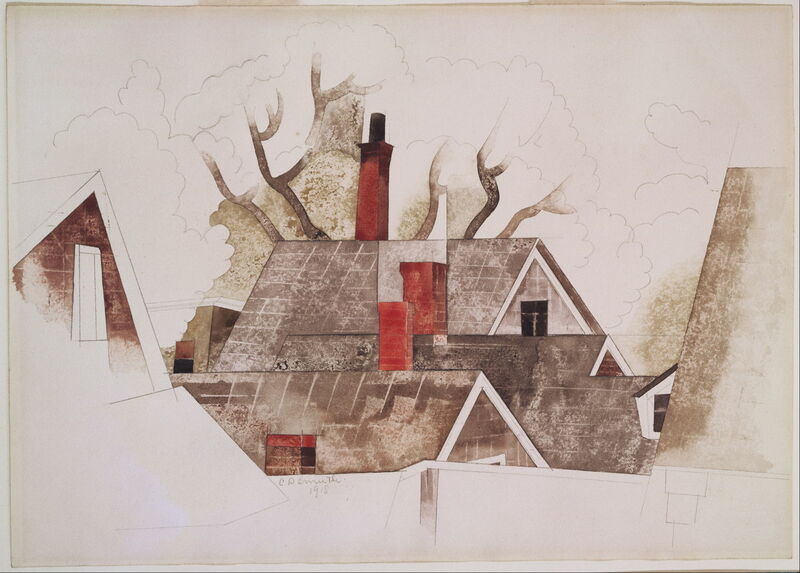 Charles Demuth demonstrated his maturing Precisionist style, with its Cubist relations, in this watercolour of Red Chimneys. 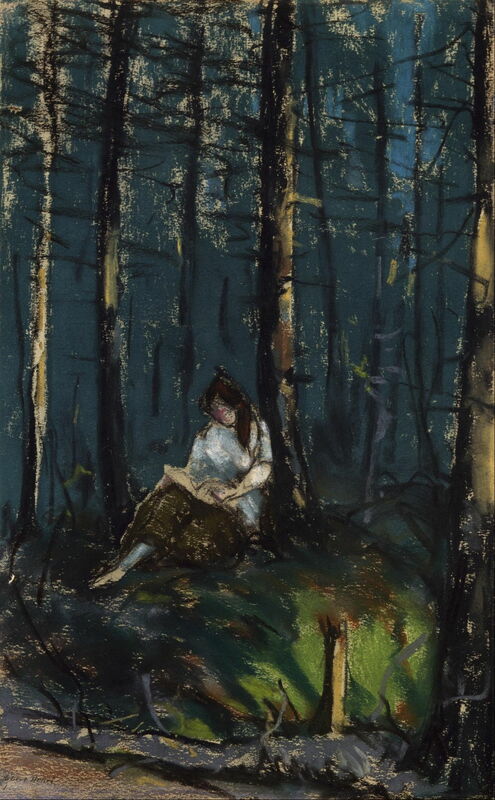 Robert Henri (1865–1929), The Reader in the Forest (1918), pastel on wove paper, 31.8 x 50.8 cm, Museum of Fine Arts, Houston, TX. Wikimedia Commons. Robert Henri had been the driving force behind the Ashcan School, and at this time was a popular teacher at the Art Students League in New York. He was turning away from his previous city motifs, and his pastel of The Reader in the Forest is an example of his direction. 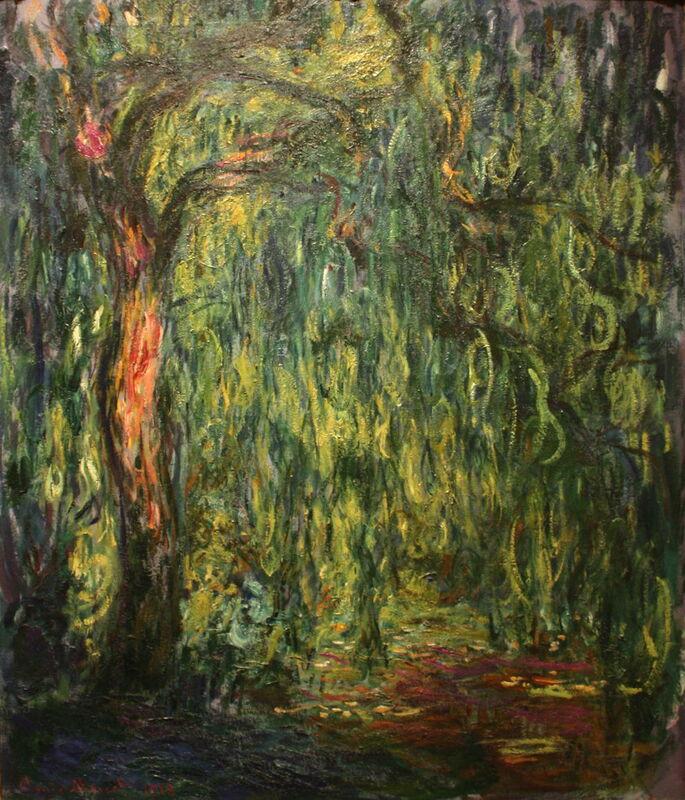 At the end of the First World War, Claude Monet concentrated his effort on series of water lilies in his garden at Giverny, and of weeping willow trees, which he dedicated to the memory of all the French personnel who had died in that war. Weeping Willow is one example of the latter works. Théo van Rysselberghe’s colours became as strong as those of the Fauves. 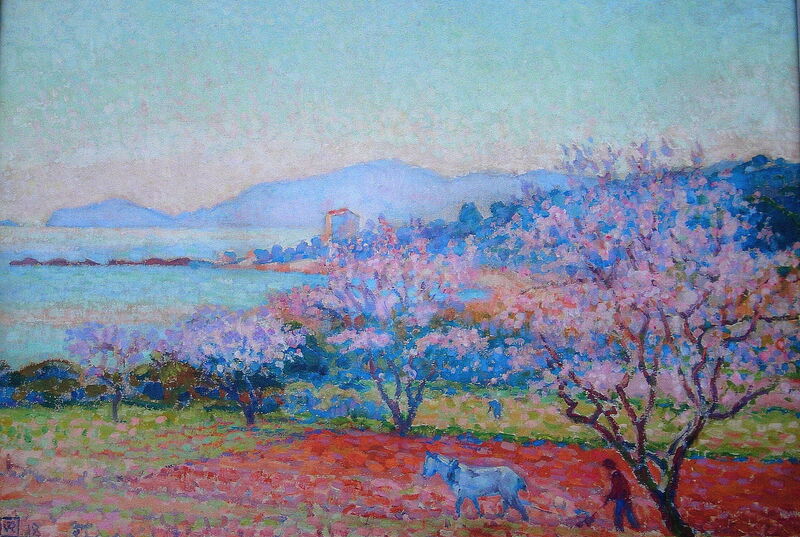 In Almond Trees in Blossom (Morning) the more delicate pinks of the flowers pale in comparison with his full reds and blues – even down to the blue horse pulling a plough. 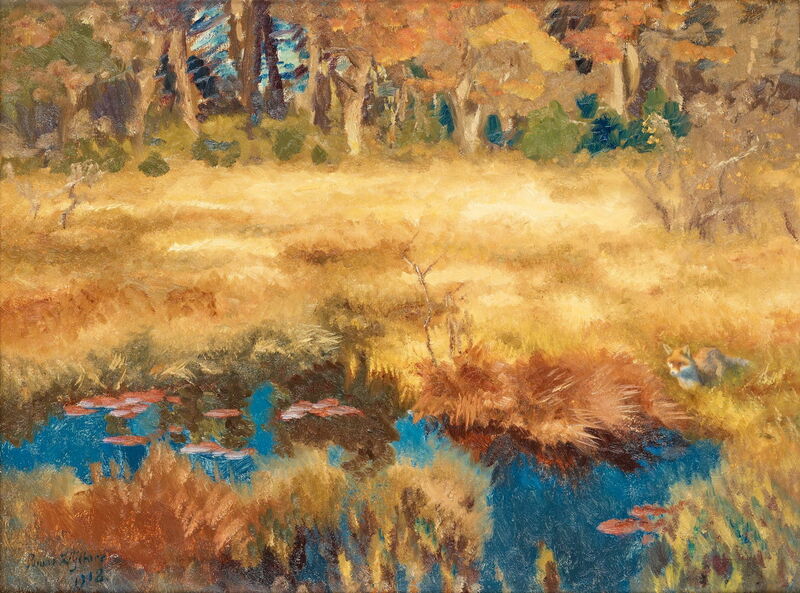 The great Swedish wildlife painter Bruno Liljefors had also became decidedly post-Impressionist, as seen in this Autumn Landscape with Fox. Tragically, in his last few months of life, the radical young Egon Schiele painted few landscapes. This close-up of a mountain stream, Brook, is one of those. There were two landscape painters whose works have particularly lasting value, in terms of their impact on subsequent art: the highly individual Pierre Bonnard, and the dying Ferdinand Hodler. 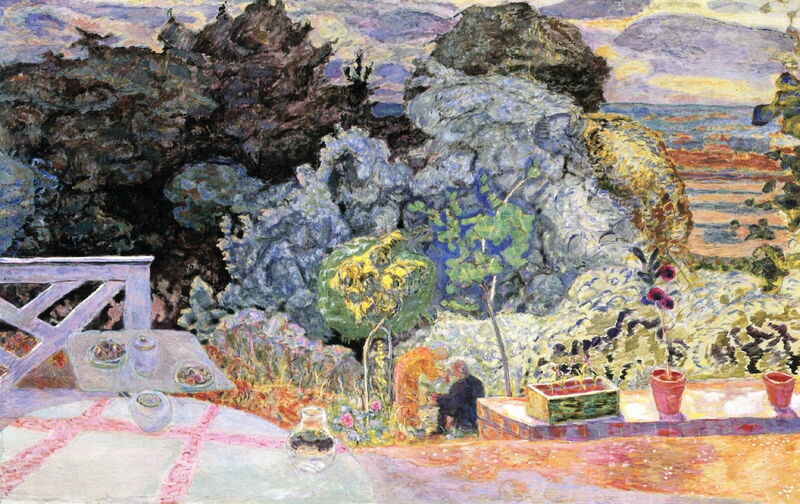 Bonnard continued to paint at a furious rate. The Terrace is an example of his many expansive views with intervening trees. 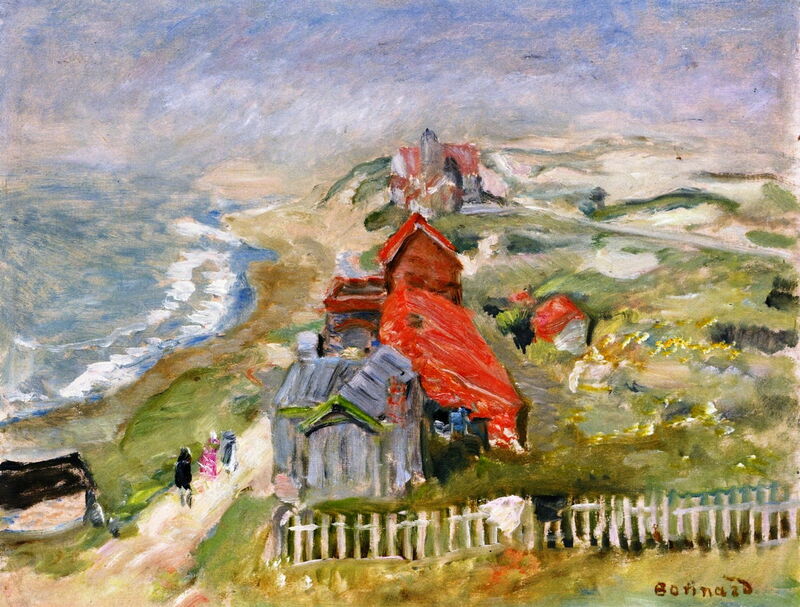 House by the Path on the Cliff must have been painted among the sandy cliffs and dunes of northern France, rather than on the Mediterranean coast which he loved so much. Although a hazy day, with quite a big sea running according to the waves, the roofs are brilliant red, even back to the church in the distance. 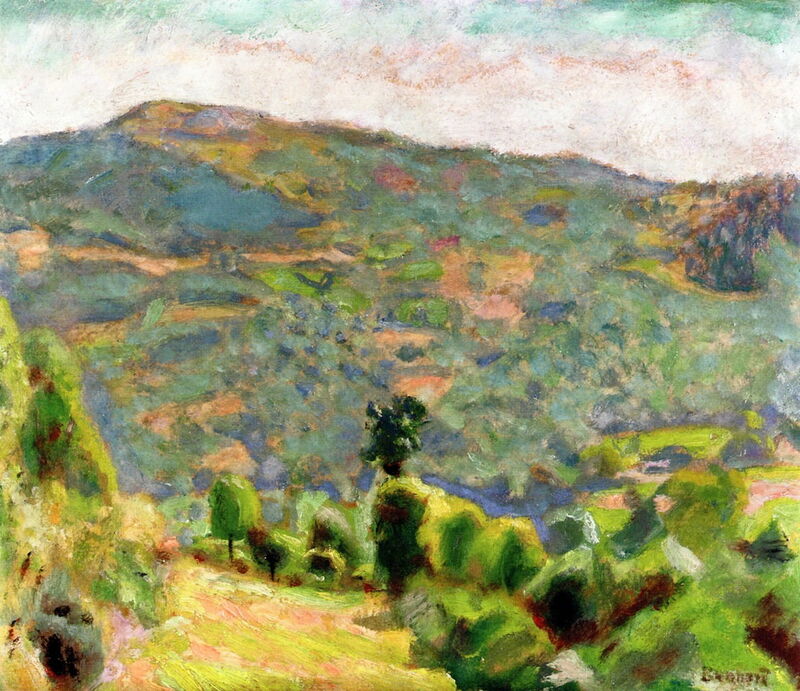 Landscape of Haute-Savoie shows the western foothills of the Alps, and must have been painted while Bonnard was staying in Uriage. 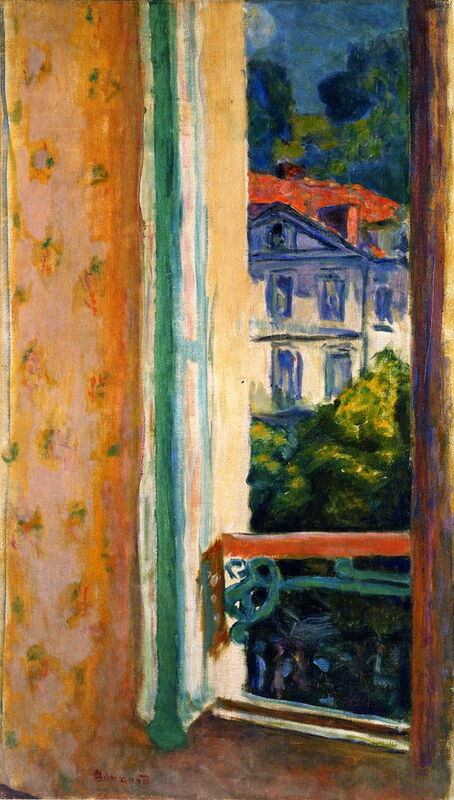 Bonnard had first developed aerial views when painting street views in Paris early in his career. These grew to include the window frame and sometime substantial parts of its surrounds, as seen in his Window in Uriage. 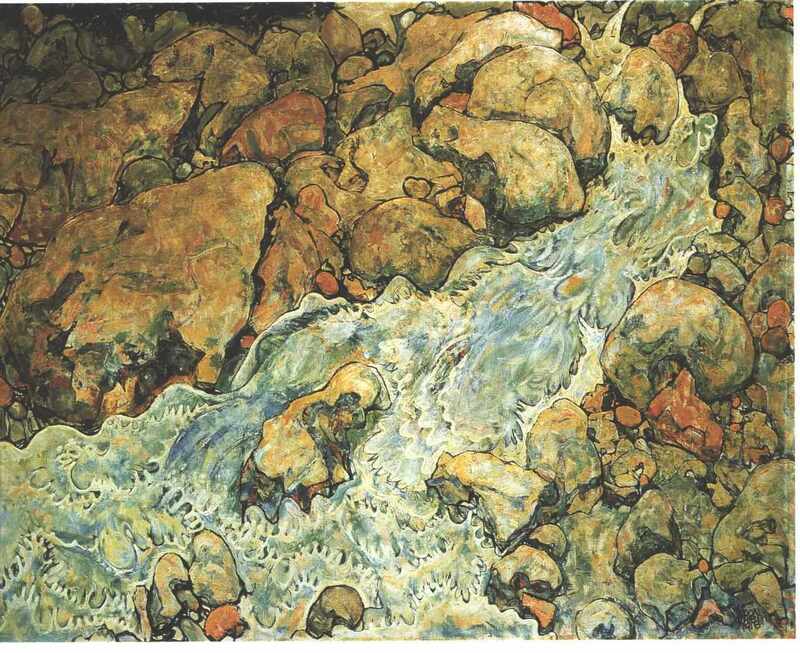 But my favourite landscape paintings from 1918 are the last series of sublime views which Ferdinand Hodler made from his home on Lake Geneva. He had been progressively eliminating detail so that these images stated just the elements of water, earth, air, and the fire of the rising sun, in their natural rhythm. 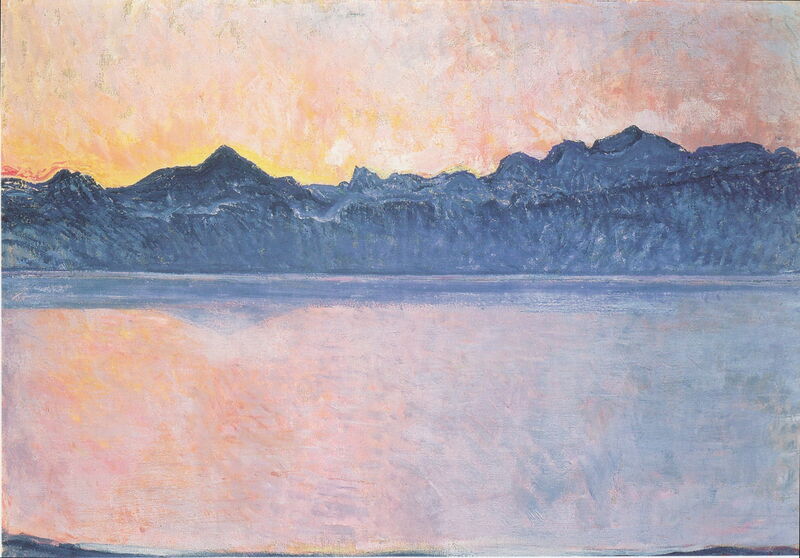 Lake Geneva with Mont Blanc by Morning Light is one of the more complex paintings of this series, with bands representing the lake shore, four different zones of the surface of the lake, the lowlands of the opposite bank, the mountain chains, and two zones of colour in the dawn sky. The lower section of the sky and the foreground shore echo in colour, and contrast in their pale lemon-orange with the blues of the other bands. Lake Geneva with Mont Blanc in the Morning Light has a much simpler structure, with the water, a band of reflections, the mass of the far shore and mountains merged, and the dawn sky. The dominant colour is the yellow to pale red of the dawn sky and its reflection. 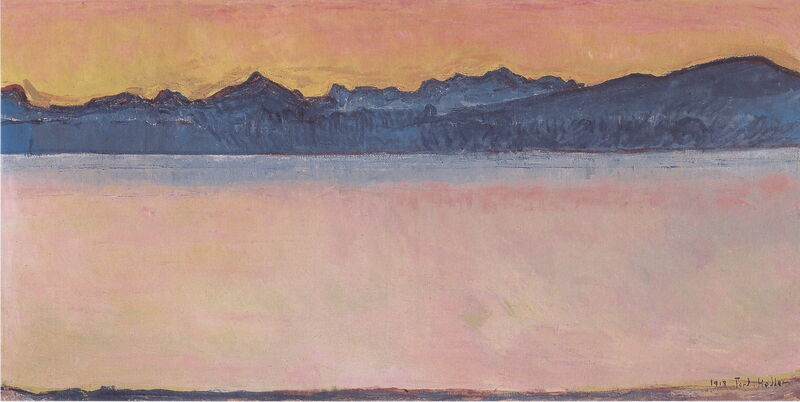 Lake Geneva with Mont Blanc in the (Red) Dawn Light is also simpler in its structure, with the water coloured by the sky, a zone of blue reflections of the far bank, the merged distant shore and mountains, and the sky. Given the end of the horrific war and the even higher death toll brought by the influenza pandemic, that is the image with which I end this review of the paintings of 1918. Posted in General, Life, Painting and tagged Bonnard, Demuth, Hartley, Henri, Hodler, landscape, Liljefors, Monet, painting, Schiele, van Rysselberghe. Bookmark the permalink. Thanks for showing this inspiring group of paintings.